I did not take the picture. Found it on the internet. 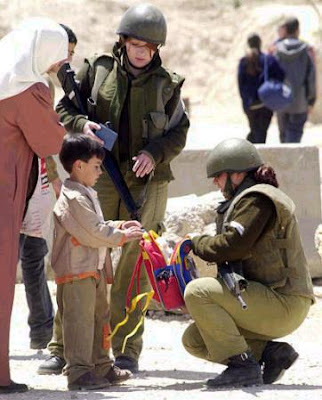 To be honest, I spent about 45 minutes looking for a picture I know of an israeli combat soldier crouched down with his hand behind him, other hand holding his gun, and behind him is a small palestinian child. There was some clash of some sort in the West Bank, I believe, and he was protecting the child from Palestinians trying to hurt the soldier even though the boy was with him. I just wanted to show how Israelis soldiers operate - to protect the innocent, even Palestinians, at the risk of life and limb. I just read your post, after I posted mine on operation Oferet Yetzukah; I am going to edit my post and link yours in mine (check it out), because I mention just this subject: the humanity of the IDF! Thank you for writing about this, and again I wish you hatzlachah and bitachon.